Last month, a man was riding his bike in a Lancaster bike lane when he was hit by a car and killed. Reports say he was traveling westbound and was hit by a car traveling eastbound when the vehicle swerved and hit the driver. The injured bike rider was taken to the hospital but eventually died from his injuries. 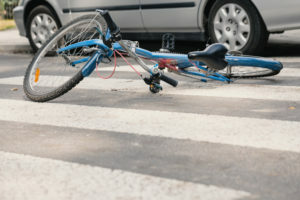 What does this say about bike accidents in general and what can we do about it? Read on to find out and then contact Law Offices of Michael A. Kahn at (310) 209-1600 if you have your own case to file. In the past, the city of Lancaster was fairly safe for bike riders but this is changing. Consider that in 2010 25 bike accidents were reported in the city, 33 in 2013 and by 2015 there were 58 serious bike injuries. That is an increase of more than 200% and it seems clear it is reason for carefully considering what the issue is and how it can be prevented. The city knows it has a problem on its hands and has taken steps to address it. For example, they are working on a wide plan of trails and bikeways, which includes better bike lanes, dedicated bike lines, better signage, and bike rakes. Across the country, these steps have been shown to improve safety and lower fatalities but they are not perfect – as evidenced in the deadly accident discussed above which happened in a bike lane. If you are a bike rider then there are steps you can take to stay as safe as possible. If there is a dedicated bike lane, then you should use it. Always ride with the flow of traffic and not against it. When you are turning, use your hand signals so that everyone knows you are turning. Make sure that you have reflectors and lights installed on your bike. At a minimum, these lights and reflectors should meet the legal requirements. When you are riding your bike at night, take extra care to wear bright and / or reflective clothing. Do not wear headphones. You should always assume that any drivers around you cannot see you. Both hand should always be on the handles and you should not overload your bike with heavy bags. Do not ride if you have been drinking or are under the influence of drugs. If you have been injured in a bike accident, or if a loved one has lost their life, please contact Law Offices of Michael A. Kahn at (310) 209-1600 for a free legal consultation. We will carefully assess your case to let you know if you have grounds for a lawsuit and what your chances are. Call today – we are standing by.